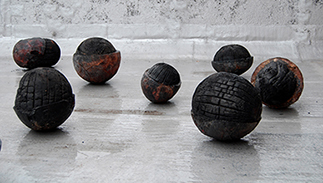 P0002 is a space installation consisting of 18 objects, 20-50 cm in diameter, made of burned wood and polyester, and documentary material that witness about the phases of composing of this sculpture installation. The objects are the result of a process of diverse treatments of wooden boulders. A common feature of all treatments is that they all represent some kind of burning such as fire-burning and chemical combustion, a turbulent reaction that occurs when the ratio of the components used during the making of polyester is not correct. In this artwork, the burning plays the "transforming" role, that is, it represents the external influence. In this process, I wanted to examine the relationship of destruction and production, which are summarized in the process of change caused by the action of an external force.